Fabulous day today, bright sunshine and lovely and warm. 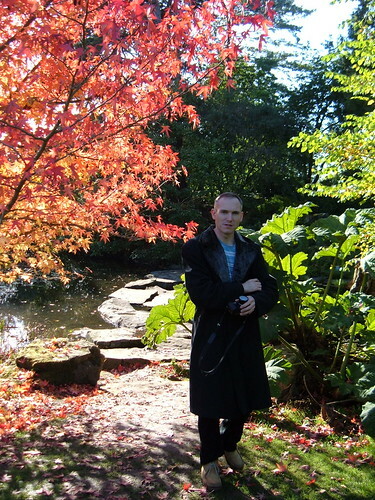 Matthew, Christopher, Michael and I walked over to the University Botanic Gardens to have a look at the autumn colours. A few of the trees had outstanding autumn displays we had a long wander around the gardens to have a look at them. Most of the trees still hadn’t fully changed to their autumn colours, which is amazing for the end of November. Fruit—raw. A sweet taste. 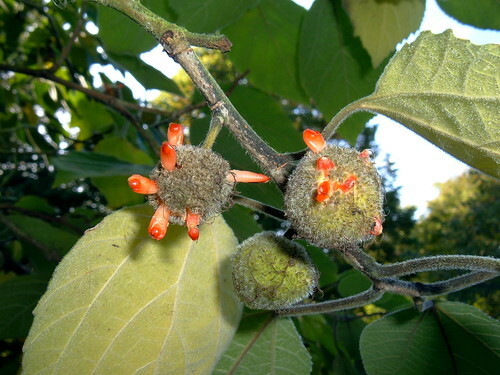 The fruit comprises a ball about 1cm in diameter with small edible fruits protruding—there is not much edible flesh but it has a lovely flavour. Prolonged ingestion of the fruit is said to weaken the bones. 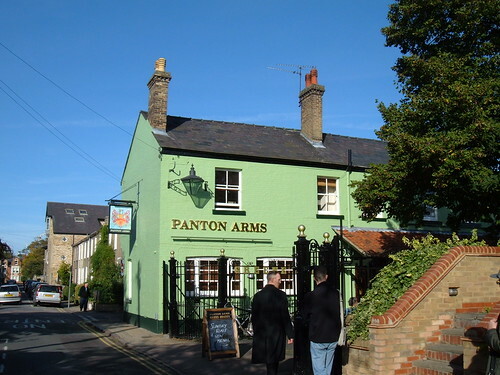 Chris and Matthew treated us to a good lunch and an IPA at the Panton Arms: now painted in Green King colours. Matthew and Christopher visited this weekend and in the evening we wandered out to see The Alchemist by Ben Jonson at the ADC Theatre. The production was fast and furious with an impressive cast with a high stamina, from the Swan Theatre Company. The Swan Theatre Company returns to the ADC, following last term’s sell-out Much Ado About Nothing, with Ben Jonson’s greatest comedy, a lightning-paced farce with a dark underbelly. Jonson’s play, written in 1610 is rarely performed, although has just opened in a major revival at the National Theatre. Lovewit has fled plague-ridden London, leaving his city house in the charge of Face, a confidence trickster. Pretending that they have found the secret of the legendary philosopher’s stone, and can transform metal into gold, the disguised Face and Subtle (the ‘Alchemist’) improvise trick after trick to draw riches from the pockets of the gullible. Yet Jonson’s play is much more than a farce—and, as the con goes on, our sympathies sway from conman to victim, as we realise how far these gulls—whether lonely old enthusiast, young first-time shopkeeper, or born-again Christian—all have a need to believe in the good fortune promised them. This new production will similarly explore the depths of theatricality contained in Jonson’s play—the audience too are to be conned by the actors—as a barrage of slamming doors, small explosions and quicksilver transformations encourage the audience too to give up their doubts and fall under the energetic, seam-bursting spell of Jonson’s finest play. Forming the central triumvirate of The Alchemist are three members of the company who were, earlier this year, renowned for their performances in the company’s ADC production of Much Ado About Nothing. Vivienne Storry, daughter of RSC Associate Artist Malcolm Storry, played Beatrice (‘Storry made her character utterly believable: wise, wry, yet with a hint of underlying melancholy’—Rachel Fentem, localsecrets.com), and now plays Dol Common, John Lau follows his ‘notable performance’ of Don John by taking on Jonson’s Face, and Alastair Roberts, Much Ado’’s Dogberry, after collaborating with Swan’s director, Robert Icke, this summer to create a ‘superb’ (Northern Echo) Andrew Aguecheek in Robert’s September production of Twelfth Night, which was hailed as innovatively intelligent and startling by the British Theatre Guide. A tremendously fast-paced energetic play—half farce, half crime-drama – which turns from laughter to horror on a sixpence, a terrific cast and lauded director, a crowd of angry neighbours and one hell of a lot of doors. In short, this new production of The Alchemist is guaranteed solid theatrical gold. The set was minimalist and we had seats at the front in row B, which meant that we had a superb view along with the heat from the lights and blare from the speakers. The loud music was the only really unlikable part of the production. The actor playing Sir Epicure Mammon was super. We managed to make it for last orders in the Free Press, then about 11pm, someone in the street kicked the window of the snug in, showering Matthew and I with glass, and covering our coats in jagged shards of glass. Not a great end to the evening. David and Craig gave chase, but the person was long gone. David gave us a free drink to settle our nerves, which was very nice! Yes, he was very helpful, helping me by laying our my clothes! in Mill Road (where we normally go for monthly wine tastings). So this was an opportunity not to be missed! The person running it, John Sanford, was a wonderful enthusiast and very amusing. There were five other people who work for the RSC there so we had a jolly old time together. We also mingled with the other members too! The most striking thing was how much a shot of watered altered the taste of the whisky: the Clynelish was gorgeous (and was 46%) but faded with a drop of water. The Auchentoshan on the other hand was pretty light and understated but livened up and got sweeter with some waster and developed a ginger flavour. Went to the Kingston Arms afterwards with Andy Nightingale and Bob Shimmens for a beer: I think that might have pushed me over the edge: we didn’t stint on the whisky. This is the first Cambridge Wine Merchant tasting that I haven’t bought anything at: we’ve got too much un-drunk whisky at home as it is. 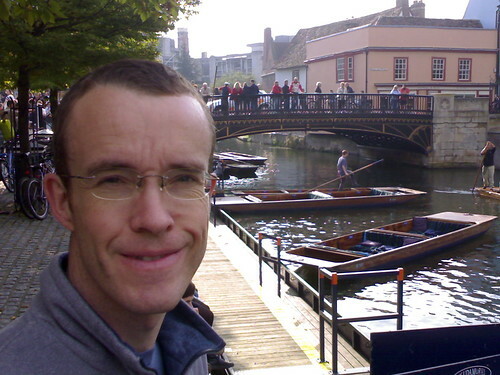 Michael and I went for a stroll today in the lovely weather, down by the river and around to Kettles Yard. The exhibition there is All About Eve focussing on Rodin’s statue All About Eve. There were two life-sized and one miniature version of the bronze, and lots of photographic studies of it. With such a narrow focus it was hard to spend more than 5 minutes in the gallery. 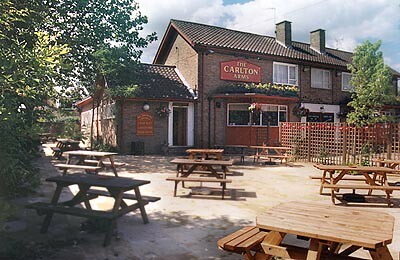 Wandered from there up to The Carlton Arms, on Carlton Way in Arbury. When we lived in Arbury 6 years ago this was far too rough a pub for us to drink in. For the past 3–4 years it has been a popular no smoking, real ale pub, voted as Best CAMRA Pub in Cambridge in 2004. We had a couple of nice pints there, along with some onion rings and cheesy chips! We stayed there about 90 minutes and had a lovely lounge on the sofas, eating and drinking. It was hard to drag ourselves back home again. I read a review of The Once and Future King last year in the Times (I think) and Michael bought me a second hand copy for Christmas (only second-hand copies were available at the time!). The book was written in the 1930’s and 1940’s. The style is unique in my experience: a common-touch narration that shifts from telling the story, to telling how the story was told in Sir Thomas Malory’s Le Morte d’Arthur. It also uses analogies with modern day life (telephones etc.) that are at odds with the period of the book. The characters are very down to earth and personable and really there is no-one to hate. The books wasn’t really what I anticipated: the story certainly followed the Arthurian pattern, but the execution was completely different. Reading it was an experience that I would recommend. An unusual wine tasting last night at Cambridge Wine Merchants on Mill Road—Mas de Daumas Gassac. It was a masterclass with M. Samuel Guibert, owner and wine maker of Mas de Daumas Gassac. This is a small vineyard in Languedoc, producing Grand Cru red and white wine. Michael and I went to Waitrose yesterday and came back with a wing rib of beef to have today. I roasted it following Heston Blumenthal’s low-temperature recipe from his book Family Food (the recipe is similar to this version from the BBC web site but using a higher temperature and avoiding the blow torch!) The beef was in the oven for about 2½ hours on low gas until the meat reached 52°C. It was superbly rare but not bloody, very moist and much better than the previous joint that I cooked this way (because the beef was better quality!). There was a lot of fat on the joint and I was a bit worried about how this would look after cooking at such low temperature: it worked out fine. I love Heston’s approach to cooking: understanding what is happening at a molecular level and applying this in his cooking. Low is the setting we normally use to warm plates in the oven. Nokia N70 Mobile Phone (with decent digital camera and bluetooth). Connect to my MAC via bluetooth. The i-Blue GPS receiver is very small and light. Turning the GPS receiver on for the first time, it took 5 min to get a fix on its position. Subsequently this takes about 10 seconds. There is a blue LED that flashes when linked to the N70 and a yellow LED that flashed when the GPS has a fix (lit continuously when not). GeTrack was very easy to install and once the GPS was paired with the phone it worked very well. Turn on the GPS, then turn on GeTrack, then start acquiring data. The bluetooth connection is then made and then you need to choose a logging interval from 5–300 seconds. When you stop acquiring a track, you are asked to save the track with a name (there is an Autosave feature in case the phone runs out of battery). You can keep multiple tracks on the phone which is useful for long trips. The GPS receiver has an energy save feature so that if it looses the bluetooth connection to the phone it goes into a low energy mode: I haven’t tried this to see how or if it will wake up when the bluetooth connection is established again. The accuracy of the CPS receiver is OK: not stunning but I don’t need it to be. It locates me me on the right street. More to follow on this. GeTrack outputs in lots of different formats and is a very straightforward piece of software. It only acquires data and sends it via bluetooth to your MAC. There are other GPS programs for the N70, principally GPSXC. This is very feature rich, displaying the satellites, current track and compass direction and also recording the track. A single track can be output in one format which would have required more organisation and software like GPSBabel to convert a track to the GPS format I needed for GPSPhotoLinker. It’s also double the price of GeTrack. I won’t be using my GPS for navigation, looking at speed or distance travelled so overall I don;t need GPSXC. 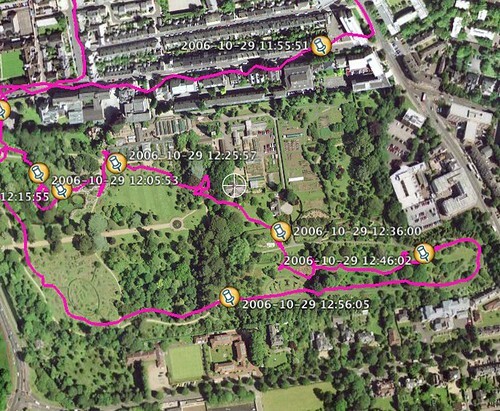 GeTrack outputs in the GPX format but also in several KML formats for Google Earth. I was really impressed how easy it was to import a track to into Google Earth on my laptop and see the track overlaid on the terrain may of home town. This is how part of today’s track looks in Google Earth. 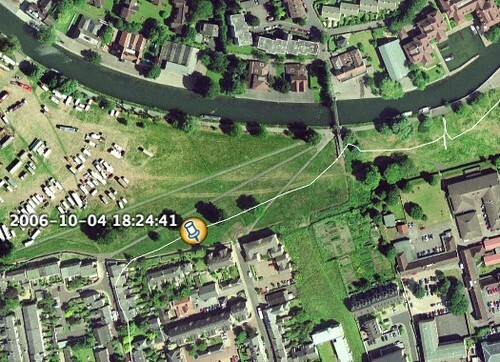 The waypoint was added by selecting an export option from GETrack (adding 5 minute waypoints to the track). Generally the track and my route don’t correlate well on this part of the journey. I stopped to take a photograph where there is a spike in the track (top right-hand side) which shows the accuracy of the GPS fix. The receiver was in my bike pannier, down by the rear wheel in a vertical orientation in an internal pocket. Perhaps if I take more care to orient the receiver it would get a better fix. However, chucking the receiver in the pannier is more my style. It was a matter of seconds to import the track and the photograph into GPSPhotoLinker. the trickiest part was working out how to match the time on the phone (BST—British Summer Time) to the GPS (UTC). This didn’t take long and the software then showed data for the GPS track points immediately before and after the photograph was taken, and also the interpolated position of the photograph between these track points. I didn’t do anything special to synchronise the time on the phone and I was happy with the result (photograph below from my Flickr Map). I imported the GPS-tagged photograph into iPhoto and then onto Flickr. (I used 1001 for the first import and the geotags were lost, they were there when I tried a second import using the Flickr direct import, so I’ll need to experiment a bit more with this). I’d set the Flickr default geotagging privacy to allow anyone to see the tagged photos on a map and to automatically use the GPS information to map the photos (both set from the Flickr account page). The tagging of the photograph is close enough for me to be really happy with this. On a recent trip to Scotland I manually tagged about 50 photographs using the Flickr interface and it was laborious work. For those photographs where there is no GPS track (for whatever reason) I’ll be using a great piece of software called GeoTagger. 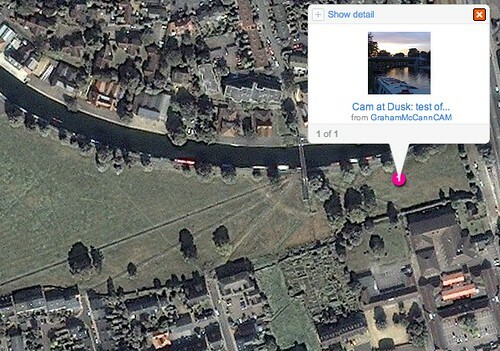 You set Google Earth to view where the photograph was taken (using a crosshair overlay to locate the exact position). 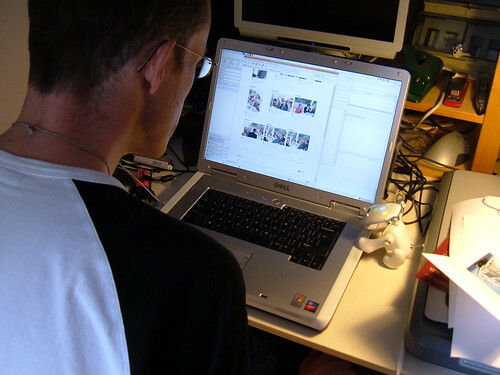 Drag and drop photographs for that location onto GeoTagger and the GPS locations are then immediately inserted (and spookily GeoTagger immediately quits too). This is much faster than using Flickr to map the photographs, and arguably more straightforward that using GPSPhotoLinker. I used this method to tag the Google photograph above (as the Google Earth window was already open from when I made the screen capture). 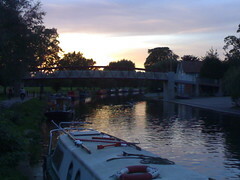 Here is the final photograph, geotagged and on Flickr. Michael’s enjoying his new iDog, which is dancing away to its top song from M People, Bizzare Fruit. It barks between songs for a bit of love and attention. Smudge and Bentley will get worried.